Vision-net together with Investec and the IEA are delighted to announce the launch of a new publication, Top 150 Born in Ireland. This report is an analysis of the leading indigenous companies in 2016. When Investec approached us to help with the research and data for this publication we were delighted to take part. - Companies are ordered in turnover in EUR. Currency conversions were performed in August 2016. - Unlimited companies are only included if their audited accounts were available to analyse. There is a separate section for high profile unlimited companies included on page 58/59 the report. - Inversion deals have been excluded. 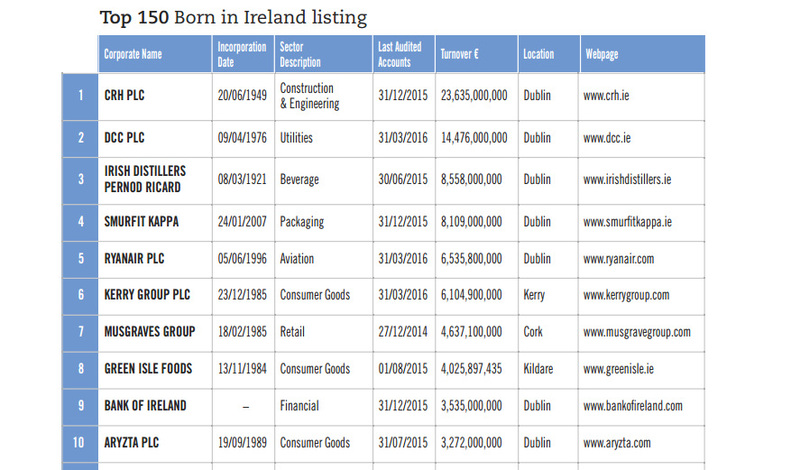 - Companies which started off as Irish owned but were taken over by larger non-Irish organisations have been excluded. - For groups we attempted to identify the most well-known brand rather than the ultimate parent. The turnover reflected will be that of the main trading entity. - Charitable companies and companies with a status other than 'Normal' have been excluded. Vision-net.ie has compiled a guide of the key corporate insolvency, bad debt and start-up trends for the first 9 months of 2016. In financial regulation, a politically exposed person (PEP) is an individual who is or has been entrusted with a prominent public function. Ireland is undergoing an extraordinary recovery and the world is watching. The 4th EU AML Directive: What You Need To know ? The EU's 4th Directive on Anti-Money Laundering was published in June 2015 and succeeds the 3rd Directive of 2005.